Western Blot analysis of BAHD1 expression in transfected 293T cell line (H00022893-T01) by BAHD1 MaxPab polyclonal antibody.Lane 1: BAHD1 transfected lysate(85.8 KDa).Lane 2: Non-transfected lysate. Formalin-fixed and paraffin-embedded human testis tissue reacted with BAHD1 Antibody (C-term), which was peroxidase-conjugated to the secondary antibody, followed by DAB staining. This data demonstrates the use of this antibody for immunohistochemistry; clinical relevance has not been evaluated. Western blot analysis of BAHD1 Antibody (C-term) (Cat. #AP50338PU-N) in MDA-MB231 cell line lysates (35µg/lane). BAHD1 (arrow) was detected using the purified Pab. 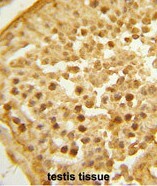 BAHD1 Antibody (C-term) (Cat. 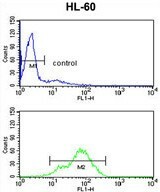 #AP50338PU-N) flow cytometry analysis of HL-60 cells (bottom histogram) compared to a negative control cell (top histogram).FITC-conjugated goat-anti-rabbit secondary antibodies were used for the analysis.